Bandleader Phil Corey (Glenn Miller) has his hands full after a publicity stunt backfires and a war orphan assigned to pianist Ted Scott (John Payne) turns out to be a full-grown woman (Sonja Henie) intent on marrying her sponsor, despite Scott’s relationship with singer Vivian Dawn (Lynn Bari), who holds the key to the band’s future success. 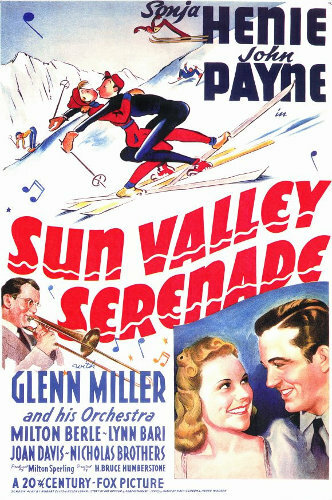 Though mostly a vehicle for Sonja Henie, Sun Valley Serenade is best-remembered today for featuring Glenn Miller and his band in their first motion picture appearance. Henie, a Norwegian gold medal figure skater in the 1928, 1932 and 1936 Olympics, was one of 20th Century Fox’s highest paid actresses at the time of the film’s release. Her popularity was such that she often commanded influence on a film and its production numbers. Fox also took care to design films around Henie’s winter sports background, and Sun Valley Serenade is no exception, featuring a great deal of skating and skiing. Henie plays Karen Benson, a war refugee from Norway who draws musician Ted Scott (John Payne) in a sponsorship lottery. Ironically, in real life Henie was chummy with Adolph Hitler and never spoke out against the Nazis or the German occupation of her home country. Indeed, Henie’s Norwegian family enjoyed protected status during the occupation. Henie is infamous for giving Hitler a Nazi salute at the 1936 Berlin games. Pre-war audiences, though, seemed unworried by that connection, as the film was successful at the box office, earning three Oscar nominations. This was Henie’s last major film however. Payne was a top box office draw as well during the early 1940s, especially when it came to musicals. Hardly a musical left the lot in that period without Payne as the male lead. As Scott, he’s genuinely flummoxed when he finds that the refugee he’s given to sponsor isn’t the child he expected. As with most films of this time period, love blooms quickly, at least for Benson, who makes up her mind that she’s going to marry Scott the first time she sees him and goes about trying to win him away from Vivian Dawn, Scott’s singer gal pal, played by Lynn Bari. 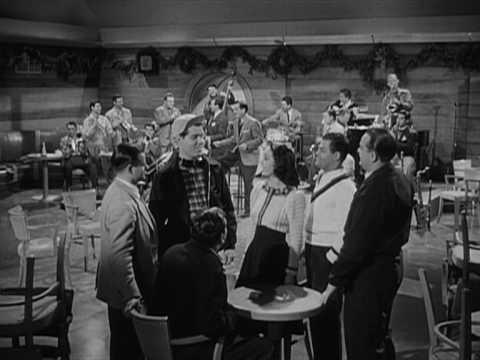 Benson is unwittingly aided in this role by Milton Berle as the band’s manager, who provides comedic relief. Musically, Miller and band shine on several numbers, including “I Know Why” and “It Happened in Sun Valley,” both sung on-screen by Bari, who was dubbed by Pat Friday. Also performed are “Moonlight Serenade,” “In the Mood,” and “The Kiss Polka.” Featured is an extended version of “Chatanooga Choo Choo,” containing a song and dance routine by the beautiful Dorothy Dandridge and the amazing Nicholas Brothers as well as the more famous rendition by Tex Beneke, Paula Kelly and the Modernaires, earning lyricist Mack Gordon and composer Harry Warren an Oscar nomination for Best Original Song. Emil Newman was nominated for Best Score. Location shots at Idaho’s Sun Valley make this film quite scenic. Cinematographer Edward Cronjager received an Oscar nomination for his gorgeous work in black and white. The skating and skiing sequences are well-produced. Skiers will probably enjoy the race down the mountainside by Henie and Payne’s doubles. Henie also performs an extravagant eight-minute ice show at the end which has absolutely no connection to the film or plot. Unfortunately, Sun Valley Serenade remains unavailable on DVD in the North American market, though it’s been released in Region 2 (Europe, Japan, the Middle East, and South Africa), which includes Norway, where Henie’s popularity continues. If you have a DVD player that can handle Region 2, you can view it. An older VHS version of the film, released in 1991, is the only product to be found in the United States and Canada. It can still be purchased, though it’s rather expensive. Amazon also lists an all regions DVD that is currently unavailable, which as far as I know is probably not an authorized release. The combined soundtracks of Sun Valley Serenade and Orchestra Wives, Miller’s other film appearance, is also available on CD.